The ribbing is worked around and the work is divided for armholes. New sts are cast on and back and front are worked separately in lace pattern. 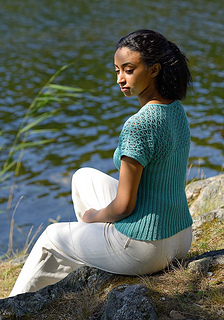 The shoulders are joined with a three needle bind-off and the neck and armhole edgings are picked up and knitted in stockinette, folded to back and sewn in place.